Home » cross pens » Facebook Contest » FB Contest » pen boutique » Pen Contest » PenBoutique » Penboutique Contest » Wish and Win - Graduation's Congratulations! Wish and Win - Graduation's Congratulations! 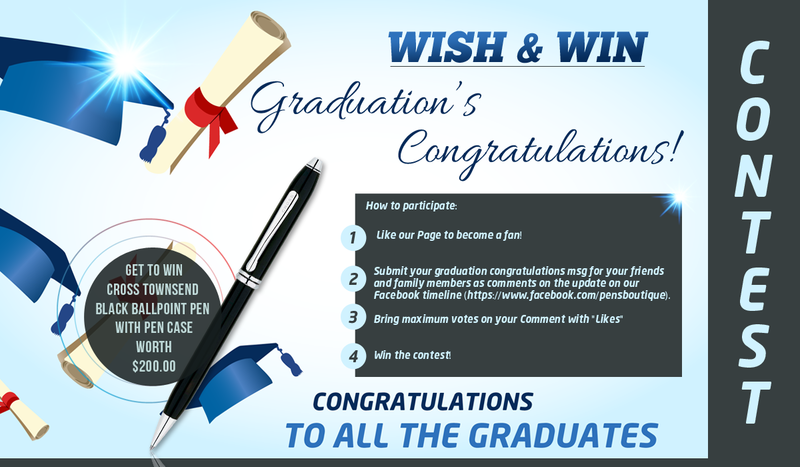 c. Bring maximum votes on your Congratulation message with "Likes"
We are hosting this 'Share and Win- Graduation's Congratulations' Contest as a way to celebrate the achievement and success of every graduate. We convey our good wishes to all our customers and fans and their friends and family who have embarked upon this glorious day of accomplishment. The participation will be transparent as comments on Facebook update. The winner of this contest will be announced on our Timeline and Pen Boutique blog (blog.penboutique.com) upon the completion of the contest deadline. Once declared winner, we will contact the participant through Facebook or email, if available. In case, we don't receive any response from the winner within one week (seven days) of first correspondence, the winner ship will be transferred to the runner up. The message with the highest number of Votes/Likes in the comment box will be declared as the Winner message. And the person will be contacted through the Facebook profile used to comment the message. 1.) This giveaway/contest is void where prohibited by law. The contestants assume the total responsibility of knowing their local laws in regard to "Wish and Win - Graduation's Congratulations" Contest and are subject to any local, state, national or international laws. Friendship Circle accepts no responsibility for making these individual legal determinations.